In 1990, Sahar Fakhoury went on vacation to Asheville and never went home. Tourists joke about this indefinite hiatus all the time — “I like it here so much I might never leave!” — but in Fakhoury’s case, circumstances were more serious. The Gulf War had erupted in her native Kuwait, and due to political reasons she could not return. There was more than one upside to Fakhoury’s change in citizenship. In the United States there are more opportunities to study art, and painting had always been Fakhoury’s passion. In college in Kuwait, she studied computer science, but the urge to study art remained. In 2005, she completed an art degree at UNC Asheville. People wondered why she would want to go back to school, she admits. “I was showing art. I was making art. I just wanted to have the academic part of it, not only my talent,” she said. Although Fakhoury paints landscapes and still lifes, people are the main focus of her work. After she arrived in Asheville, a lot of those people represented civilians enduring the consequences of war. Many of these compositions are relatively simple and subdued. Rubble and red light engulfs the figures. She said she hoped the images would challenge the rhetoric of war. Since 2010, Fakhoury’s work has shifted, although her focus on the figure remains. In her most recent paintings, she explores movement, which she sees as a way of telling a story, the story of a few seconds. A dancer shimmies across the canvas. A young boy chases waves on the beach. A trumpeter sways from side to side as he plays. The paintings resemble time lapse photographs with their multiple representations of the same figure. When Fakhoury began this work, she said it felt very experimental. She began slowly, and as she embarked on these radical new projects, she grounded herself in classic practices. She joined The Asheville Urban Landscape Project and began painting en plein air, painting outdoors and observing and recording the light and atmosphere of a particular time of day. As a result of this project, she paints smaller canvases than ever before. They’re more manageable to move, she explained. Also, they can serve as visual notes for larger compositions created in the studio. “They can be sketches, or you can start on a small painting and if you want you can make a bigger painting out of that,” she said. In a collaborative exhibition, “Small Jewels,” Fakhoury and fellow painters Sandra Brugh Moore and Virginia Pendergrass are devoting an entire wall of their Riverview Station studio space to these smaller works. “Small Jewels” showcases these compositions, which are sized for holiday gift giving. Fakhoury said she’s never gotten a painting as a gift herself since she’s a painter, but she sometimes gives them as wedding gifts. She said the landscapes, flowers and still lifes depicted on the smaller canvases are particularly well suited for gifts. •“Small Jewels,” an exhibition of paintings by Sahar Fakhoury, Sandra Brugh Moore and Virginia Pendergrass is open through Dec. 31 in Riverview Station, Suite 216, 191 Lyman St. A reception takes place 4-6 p.m. Dec. 12. To learn more, visit sahar-art.com. •The reception corresponds with the Riverview Station holiday market, which features special activities at more than 20 studios from 4-8 p.m. Dec. 12. The event includes a food truck, Santa Claus, door prizes and more. For details, visitriverviewstation.com. 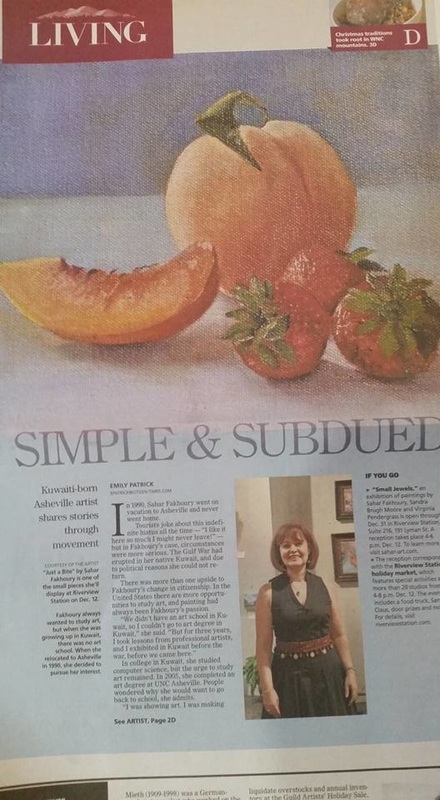 Sahar Fakhoury, President of the Asheville Gallery of Art, is a figurative artist. She is inspired by body movements and expressions of people she encounters in her daily activities. Her mediums are oil paint, mixed media, collage, clay and other materials. 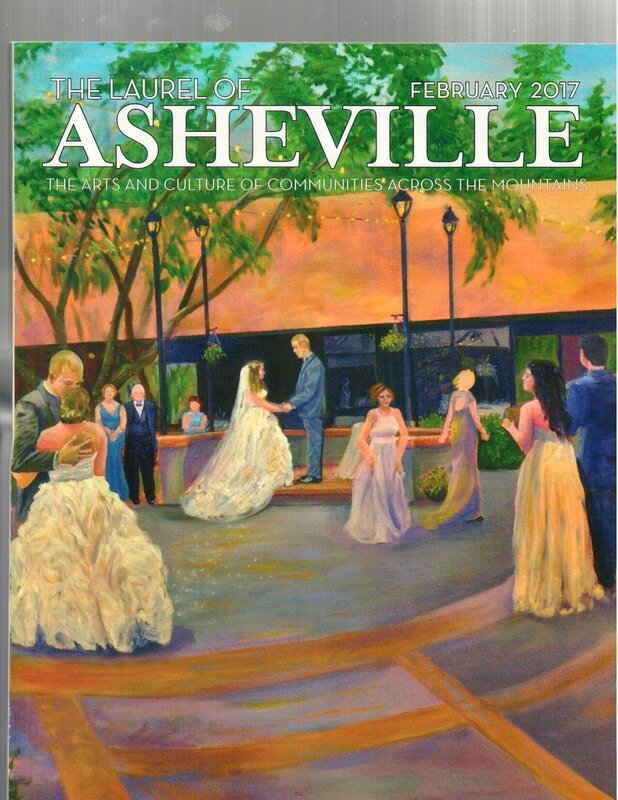 At 26 years, the Asheville Gallery of Art (AGA) is the longest established fine art gallery in Asheville. In January and February, AGA is showcasing artists new to the gallery in the “New Kids on the Block” and “Who New?” shows. Rapid River Magazine: What can you tell us about your new artists? Sahar Fakhoury: Our newest artists are a great addition to AGA’s family. They offer a variety of styles, from abstract to realistic landscapes, figures and still-life. Each artist has his or her unique painting technique that suits their medium, whether in pastel, oil, acrylic, watercolor or mixed media. Each artist has a different mood, which speaks to different consumers. This diversity is what sets us apart at AGA. RR: There are so many great artists in the area- how do you choose artists for gallery membership? SF: AGA has a waiting list of juried artists from this region. As attrition depletes the list, we call for 2-D artists to submit paintings for review. AGA’s demanding jury committee looks at paintings for quality, diversity in styles, and professionalism. There are no limits on style or medium, as long as the body of work meets the gallery’s high standards, and the artist has a contribution to make to AGA. 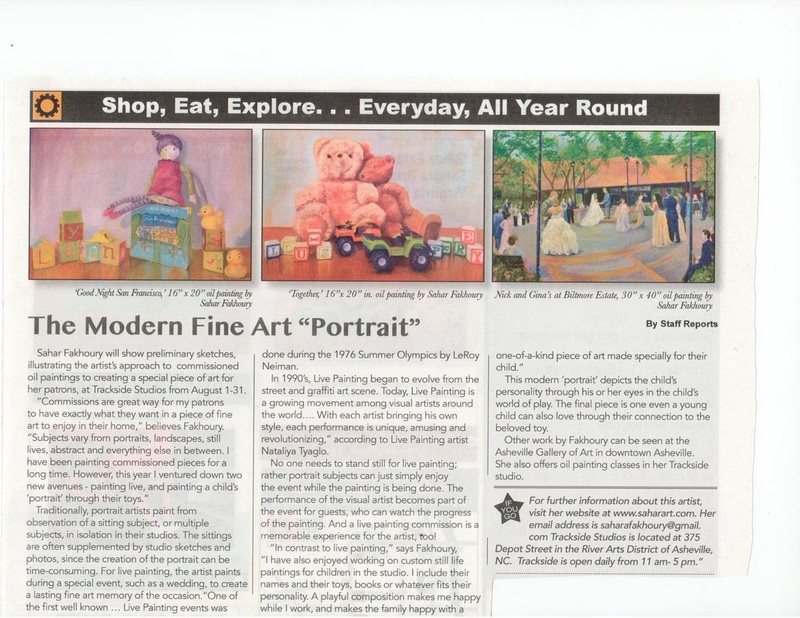 Featuring works by French Broad Artists Sahar Fakhoury, Sandra Brugh Moore and Virginia Pendergrass. “Small Jewels, Paintings 12 x 12 in. or Smaller” will be on display throughout December. The reception for the show will be held Saturday, December 12, 2015 from 4-8 p.m. at their studio in Riverview Station #216 in the River Arts District. Plein air painting is a case in point. Because it is difficult to paint large paintings in one session outdoors, Monet returned again and again to the same outdoor scenes to produce large paintings of haystacks and cathedrals. This is the current American solution to the dilemma of catching wonderful light en plein air – paint a small canvas fast during a two-hour interval in the morning, and again in the afternoon. Larger studio pieces develop from this fresh experience. In the 1880s, one collector famously described Whistler’s small scale works as “superficially, the size of your hand, but, artistically, as a large as a continent.” The small jewels of Fakhoury and her studio partners make ideal gifts for the season. 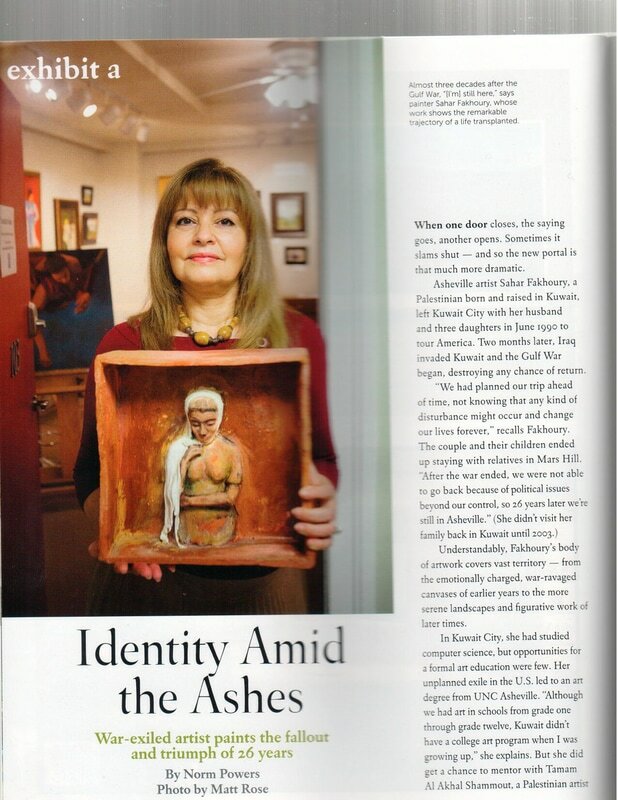 Fakhoury also exhibits her artwork at the Asheville Gallery of Art in downtown Asheville. Visit her website, www.sahar-art.com. If You Go: “Small Jewels, Paintings 12 x 12 in. or Smaller” on display throughout December. Opening reception Saturday, December 12, 2015 from 4-8 p.m. at the French Broad Artists studio in Riverview Station, #216 in the River Arts District.